I'm a big fan of split breaks, kickoffs, leads, endings, and this is a great example of a short break from Volume 4 of "The Bluegrass Album Band". I tabbed this out by request and now I'm glad I did it. You have to listen to this break explode into existence from the first 2-3 notes to really appreciate it. 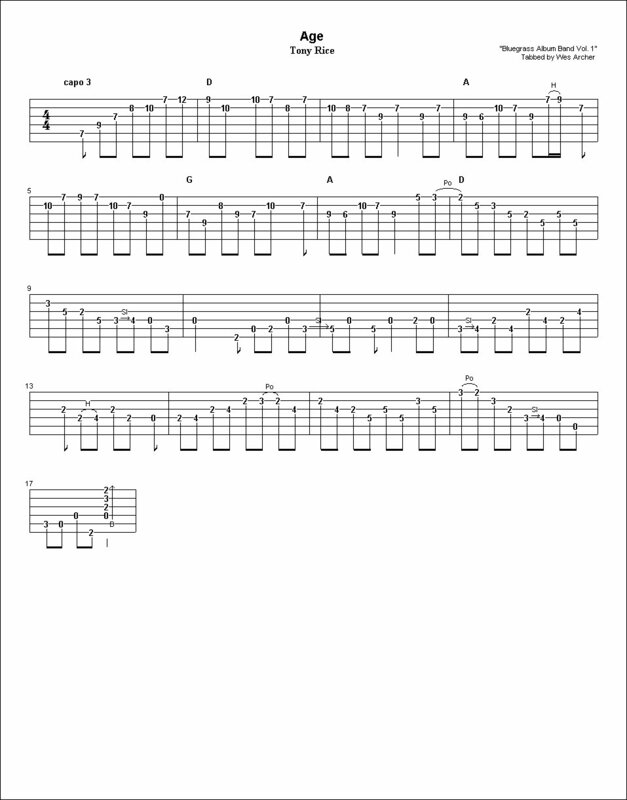 Tablature does not do it justice. The very first note played at the 7th fret is interesting. How does Tony get that sound at the start? Well, if you play that first note then lift your finger from the fretboard you will hear the note continue, as this is a harmonic. Just another tidbit that makes his playing so dynamic. Also pay close attention to the rests and pauses and the accents placed on syncopated notes. Many of Rice's breaks are improvised, but I do not believe this one is. I think Tony put some thought into specific notes to be played in this solo.